What’s Weld Overlay or Weld Cladding? Inconloy 825 weld overlay on a heat exchanger tubesheet for corrosion resistance at high temperatures. Weld overlay, also known as weld cladding, is a typical surfacing process in which a relatively thick layer of weld metal is weld cladded to the base metal surface. Depending on the wear-resistance or corrosion resistance properties imparted by the deposition, it is referred to as hardfacing or corrosion resistance alloy (CRA) weld overlay, respectively. 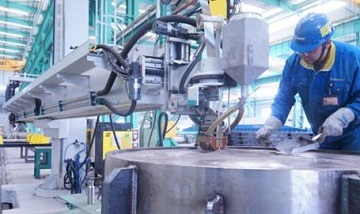 The application of weld overlay not only imparts properties to the surface of a substrate that are not available from that base metal, but also conserves expensive or difficult-to-obtain materials by using only a relatively thin surface layer on a less expensive or abundant base material. Usually the base metal (substrate) for the weld overlay component shall be less expensive carbon steel or low alloy steel such as ASTM A36 or ASTM A516 Gr.60 or Gr.70 plates. The cladding material (deposition) is usually an austenitic stainless steel, a duplex stainless steel, a nickel-base alloy, or a copper-base alloy. Titanium, zirconium, magnesium, pure copper, and aluminum are typical incompatible metals for weld overlay/ weld cladding on steels since they do not tolerate significant amounts of iron. The filler metals may be furnished in the product form of bare rods, covered electrodes, coiled electrode wires, or strip electrodes. 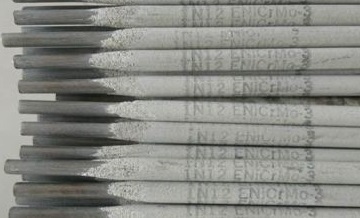 AWS A5.11 ENiCrMo-3 covered electrodes for Inconel 625 weld overlay. The depostion during CRA weld overlay consists of filler metal added and a small amount of molten base metal. Dilution of the filler metal with the base metal shall be evaluated and recorded as an important parameter. The percentage of dilution equals the amount of base metal melted (a) divided by the sum of filler metal added (b) and base metal melted (a), the quotient of which is multiplied by 100: %dilution = a / (a+b) * 100. By affecting the composition and metallurgical balance directly, dilution has significant influence on the microstructure and properties (such as bond integrity, hot cracking & corrosion resistance) of the deposition. There are four microstructure prediction diagrams which are widely used in engineering practice: the Schaeffler diagram, the Delong diagram, the WRC-1988 diagram, and the WRC-1992 diagram. The weld overlay can be implemented by the following processes: submerged arc welding (SAW), plasma arc hot wire process, self-shielded flux-cored wire process, shielded metal arc welding (SMAW), and metal inert gas welding (MIG), etc. The weld overlay/ weld cladding technique is generally used for corrosion resistant applications covering oil and gas industry, chemcial processing, offshore and marine industry, power plant, paper and pulp industry, as well as food processing industry, etc. Typical components that are weld overlayed include heat exchanger tube sheet, paper digesters, urea reactors, nuclear reactors, hydrocrakers, valve seats, and RF or RTJ face flanges.